I am a survivor of breast cancer. I becan taking the black seed oil after chemo treatments and noticed that generally I felt alot better that I had in the past. I now have been taking them for 3 years and I am still cancer free and still feeling great. My husband has been asking me to buy him the black seed oil capsules since the oil itself tastes very strong and hard to ingest. So few weeks ago I got him the Sweet Sunnah Black Seed Oil capsules and he's told me it has boosted up his energy and he can go on without taking his usual naps during the day and also that he's been having less gas. I personally use many other Sweet Sunnah products and it's my favorite black seed online store! Muslims taking nutritional supplements should use black seed products if for no other reason that it has been recommended by our holy prophet. 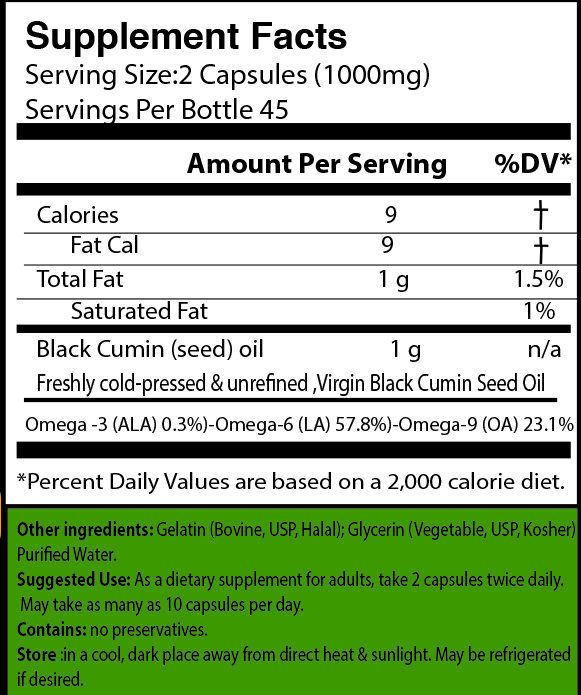 I don't like the taste of black seed oil, so using halal gelatin capsules is a good option for me. When I use it I pray that Allah will grant me good health. My sister and her daughter love this product.My niece gave a tea spoon full to her brother when he had an terrible cold and it got rid of his cold in one day.You can not get any better then that. My family and I take this. My youngest kid always get sick with a cold or tempatures and etc. Now i he doesn't get sick anymore. It saved me time and money on so many levels.